Advantech Wireless' 1.2m Engage™ Class High Performance VSAT FlyAway Terminal has been certified by a NATO customer. 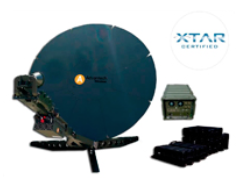 The new Engage™ Class 1.2m Flyaway VSAT Terminal Solution includes advanced SATCOM technology. This flexible and transportable VSAT solution from Advantech Wireless is a fully integrated tri-band system designed for easy deployment and use. The terminal is based on a high efficiency, ruggedized tri-band ready 1.2 Meter Flyaway Antenna, which can cover X-Band, Ku-Band, or Ka-Band, by replacing the feed only. The antenna is fully motorized with an integrated satellite finding controller. The terminal has built-in either unique triple access mode satellite modems based on the new ASAT II™ system , or SCPC mode modem AMT-83L, Mil 165A Grade and DSSS Spread Spectrum Technology. The ASAT II™ system technology allows the same modem to operate 3 different access wave forms, and achieve the most efficient bandwidth utilization possible. Cristi Damian, VP Business Development at Advantech Wireless said that these advanced VSAT terminals, include state-of-the-art satellite technology. The system can uplink two separate carriers and hence establishing a solid backbone connection between a field command center and distributed resources. The system is completely integrated with power supply system, GPS, routers, and test equipment. By selecting the best Advantech knowhow and technology, we managed to offer almost 10 times more data rates than originally planned by the customer.